MaintenX hits a home run with employees as they celebrate the start of the Major League Baseball season with a stadium-food themed cookout. MaintenX employees Russell Leffers, Raul Loyola and Chas O’Hara help grill burgers, sausages and hot dogs for MaintenX’s Opening Day celebration. 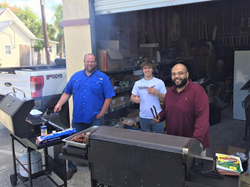 Today’s cookout was just another way we show our employees how much we appreciate all they do to make MaintenX the successful business it is. Employees at MaintenX International’s headquarters in Tampa, Fla., celebrated the return of Major League Baseball with a staff cookout. To mark the occasion, employees grilled burgers and hot dogs while snacking on Cracker Jack® and popcorn. It was easy for all involved to get in the spirit of the game. Employees were encouraged to wear their favorite baseball team attire for some friendly competition during the celebration. “We might not root for the same team, but we all work together on the same team,” Schaphorst said. “We pride ourselves on leaving the rivalry on the field and working to provide quality service with a focus on customer satisfaction and safety. In addition to celebratory barbecues, MaintenX offers employees fun and unique perks like tickets to Spring Training games, weekly onsite car wash days, catered lunches and an onsite gym. In addition, MaintenX Team members receive benefits like paid vacations and holidays; medical, dental and vision insurance; and 401(k) options with a 5-percent match and immediate vesting. As one of the largest facility maintenance and repair companies in the nation, thousands of business locations trust MaintenX to be part of their facility management team. To learn more about MaintenX or make an appointment with one of their skilled technicians, visit http://www.maintenx.com. MaintenX International is a fully licensed, facilities repair company. As one of the largest national self-performing facility maintenance and repair companies in the U.S., MaintenX has created a wide network of knowledgeable and professional technicians throughout the country. With their team of well-trained technicians, MaintenX self-performs and manages facility maintenance for their clients. In the event there is not a MaintenX technician in an area, the company has established a network of preferred vendor partners throughout the country for continued superior service for their clients. For more than 40 years, MaintenX has been expertly serving multi-location retail stores, restaurant chains and Fortune 500 companies nationwide.